MSI, world leading in motherboard technology, announces its 2nd generation of ECO motherboards, based on Intel's 100-series 'Skylake' chipset. 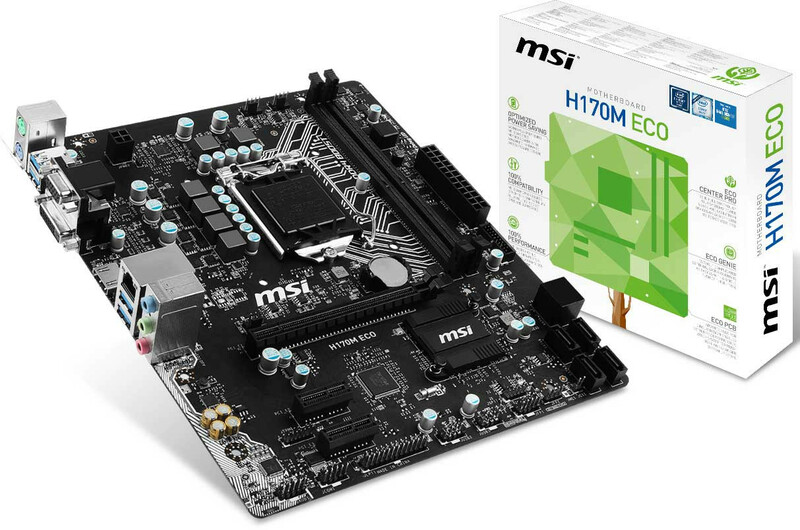 Introducing 3 new models, the MSI H170M ECO, B150M ECO, and H110M ECO motherboards offer industry leading power efficiency while retaining optimal performance. This is made possible through the new MSI ECO Series motherboards optimized PCB and circuitry design. This allows for saving more energy without sacrificing performance, compatibility or functionality. ECO Genie and ECO Center Pro allows the user to completely control the system's power consumption and feature set through an easy to use interface. The 2nd generation MSI ECO Series motherboards offer more features than ever, without impacting it's power efficiency or performance. Reliable and efficient Intel Gigabit LAN with 15kv anti-surge LAN Protect offers a stable and secure networking solution. Through carefully selected and thoroughly tested components and materials, Guard-Pro and Military Class 4 provide industry leading stability. Even Audio Boost can now be found on MSI ECO Series motherboards as a testament to technical ingenuity. MSI ECO Series motherboards are focusing on power efficiency. ECO PCB is a groundbreaking hardware design for ECO Series to use less power. Included in the new PCB design is hardware based control to cut off all power to features on the motherboard. The hardware control of onboard features also allows control of standby power. ECO Series revolutionary PCB design preserves optimal performance while saving power. Where other power saving options highly impact performance because of undervolting and lowering clock speeds, MSI ECO Series motherboards are capable of delivering 100% performance while operating in any power saving mode. No need to worry about compatibility. While others exclude support for high TDP processors to save power, MSI ECO Series motherboards support all Intel 6th generation Core, Pentium and Celeron processors. Because of its power saving nature MSI ECO Series motherboards are optimized for Intel S & T series power efficient processors. High speed DDR4 memory is also supported in both single and dual channel mode. The 2nd generation ECO motherboards are packed with more features then ever. Equipped with DDR4 Boost, a high quality Gigabit network solution from Intel, Audio Boost and much more, the MSI ECO Series motherboards are optimized to deliver great power efficiency and a rich user experience at the same time. ECO Genie is a new solution in BIOS to set up and customize ECO profile easily. Besides the 3 pre-configured modes, it allows to set the details such as disabling hyper-threading, or choosing voltage modes. Always connected with INTEL Gigabit LAN networking. MSI ECO Series motherboards feature INTEL Gigabit LAN, optimized to deliver a stable and efficient network connection at low CPU usage. With the 15kv anti-surge LAN Protect to lower your system under risk. ECO Center Pro allows turning off the power completely for casefans, LEDs… etc. For more convenience in power saving ECO Center Pro offers 3 pre-configured fully customizable power saving modes through ECO mode, Lounge mode and Server mode. For more information, visit the product pages of the H110M ECO, B150M ECO, and H170M ECO. Sacrificing M.2 slot, SATA Express, two RAM slots, EPS12V socket and USB 3.1 for some tiny energy saving, NOT worth it. Make 'em white and you got urself a sale. Yeah, I'm aware majority of the PCs sold are for office use. 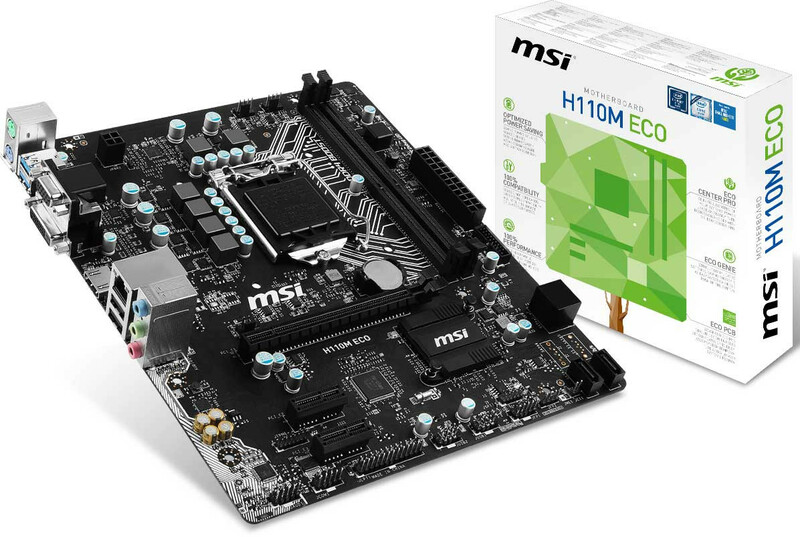 But there are already low-end H110 boards like MSI own H110M Pro-VD. What's the point of the ECO series? If they are going to be even cheaper than existing low-end offerings which are already really cheap (that H110M Pro-VD is only £40 in UK), by how much? If they are going to be more expensive, do you really think it's worth paying extra for some tiny energy savings? Well if this is true, its price is probably going to be close to £30. Wondering where they source all the electrical components and how they are going to recover the cost invested in designing the so-called energy saving special circuitry with such a low price tag. You might be surprised at how much the cost of producing each MB, especially for a company as huge as MSI. Think China and mass produce. This allows for saving more energy without sacrificing performance, compatibility or functionality. ECO Genie and ECO Center Pro allows the user to completely control the system's power consumption and feature set through an easy to use interface. Probably using some Windows-only software. Not that I care, my AsRock Extreme 7+ should arrive on Saturday. I am not missing anything except two RAM slots and two SATA ports they removed on H110M. , post: 3377700, member: 128414"]You might be surprised at how much the cost of producing each MB, especially for a company as huge as MSI. Think China and mass produce. I think it would be better if they made less models with more features and two H chipset models is in my opinion too much. A lot of motherboards really differentiate in too little things. I've stared at the specifications and product images of H110M ECO, B150M ECO, and H170M ECO for a while. From what I saw, they are nearly identical in both features and appearance—it’s obvious that they came from the same design. H110M has 2 SATA ports removed and 2 rear USB 3.0 ports replaced with 2.0. H170M supports RAID. Those are all visible and significant differences.